Boots & Beards are privelaged to be made, the first BME organisation in Scotland, a licensed partner with the Duke of Edinburgh. Have you got the spirit of adventure? Do you want to try new things, visit new places, and meet new people? Do you want a CV or UCAS application that stands out from the crowd? The Duke of Edinburgh Award gives you the chance to meet people, learn new skills, develop your talents and have fun. Grab this opportunity to take part in fun-packed, challenging and adventurous programmes that's recognised nationally and internationally. It gives you something to put on your CV, lots to talk about at an interview and it also shows that you’ve developed lots of skills employers are looking for, such as teamwork, resilience and communication to name a few. The Duke of Edinburgh's Award is one of the world's best-known and most respected achievement awards - and now you have the chance to get involved and achieve your Bronze/ Silver Duke of Edinburgh's Award. A Bronze DofE programme has 4 sections, Volunteering, Physical, Skills and Expedition. If you aren’t 15 yet, but are in the school year in which your peer group turn fifteen, you may be able to start a Silver DofE programme - check with your DofE Leader. 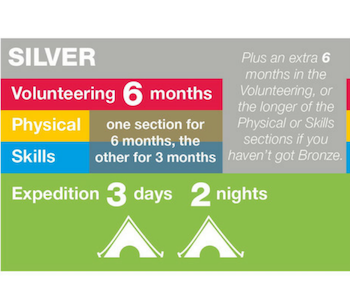 ·If you didn't do Bronze, you must undertake a further 6 months in either the Volunteering or the longer of the Physical or Skills sections. £129 per applicant (inc registration, expedition equipment (does not include clothing), certificate. Low Income Family DofE Registration Scheme £89 (to qualify please register here). For more info please contact Nav on 07861656811 or email nav@bootsandbeards.co.uk. Please note CLOSING DATE for all applications is Sunday 30th June 2019. Thank you, someone will be in-touch shortly!